In January 1923, the War and Navy departments reached an agreement whereby the latter would vacate Fort Norfolk by March 1, 1923. The Inspector of Ordnance was allowed to remain at the house until new quarters could be built at St. Julian’s Creek (ROCE, Correspondence 1884-1923, Terms of Agreement, January 15, 1923). In May, the U.S. 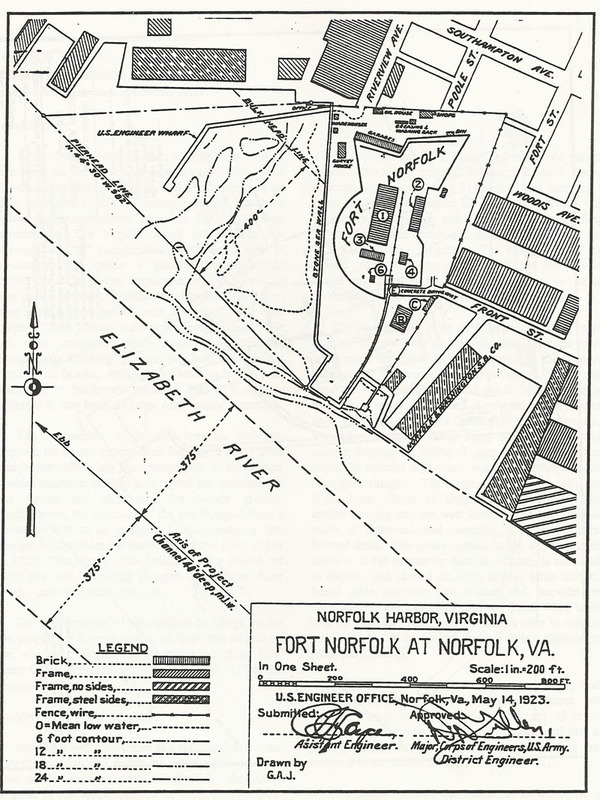 Engineer Office produced a small-scale map showing the entire Fort Norfolk reservation, including the new wharf and harbor. Several new service buildings can be seen outside the walls to the rear of the fort (U.S. Engineer Office 1923) (see above). In 1935, the Norfolk District of the U.S. Army Corps of Engineers moved their offices to the Federal Building in Norfolk. In early 1942, after the United States entered World War II, the U.S. Army Corps of Engineers returned to Fort Norfolk (U.S. Army Engineer District n.d.:48-49). Five new two-story buildings were erected on the reservation. As noted above, the construction of one of the new office buildings necessitated the demolition of the old magazine keeper's house. Several new buildings were constructed at Fort Norfolk during the first year of World War II. In June 1942, the U.S. 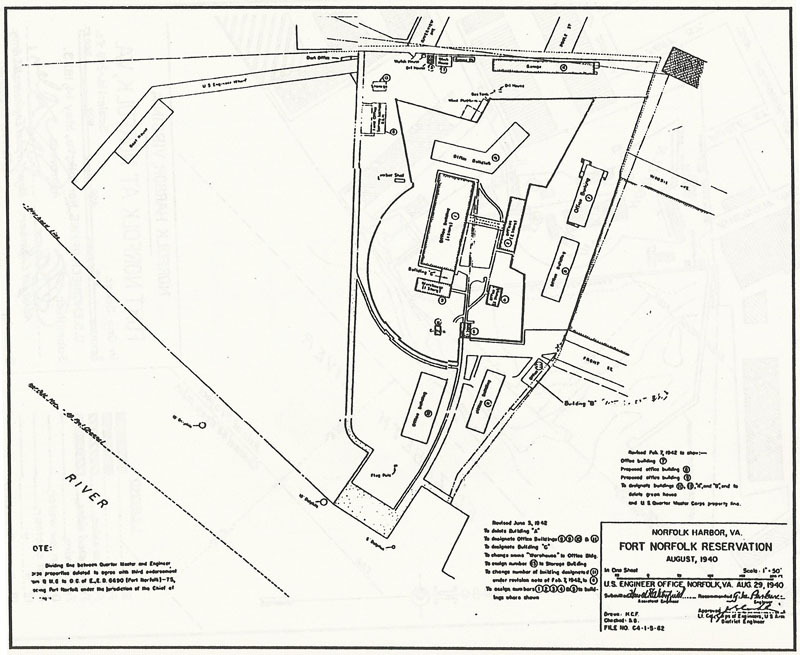 Engineer Office produced a plan of the fort property showing the location of the completed and proposed new buildings (U.S. Engineer Office 1940-1942) (Figure 28). In 1949, the U.S. Army Corps of Engineers purchased the adjacent property belonging to the Norfolk and Washington Steamboat Company. The Front Street Dock property was used for the U.S. Army Corps of Engineers' survey section and for additional warehouse space (Virginian Pilot 1949). Since World War II, most of the building projects carried out at Fort Norfolk have been well documented, and plans can be found at the U.S. Army Corps of Engineers Library. By far the most significant construction occurred during 1981-1982, when the four-story office building that now houses most of the U.S. Army Corps of Engineers offices was constructed. The ample size of the new building allowed the U.S. Army Corps of Engineers to demolish many of the temporary World War II era buildings. In doing so, much of the integrity of the original fort was restored (Cobb 1981).